We supply state-of-the-art, innovative systems for gas analysis and process control. Our goal is to provide our customers with the most advanced, reliable and cost-effective systems, regardless of applications. Systems are available for ambient air quality monitoring (AQM) and continuous emissions monitoring (CEM)/process control. Orica is aware of the reality and urgency of the climate change issue and its potential impact upon our world and on the mining industry. Our Customer research has indicated that energy and greenhouse gas emissions are the most difficult issue many of our Customers face. Parameters covered: PM, SO2, NO2, CO, Hydrocarbon/NMHC etc. Filter Thimble: collection of particulates down to 0.3 micron. GPRS based solution, no need of laying communication cables. Monitors PM10, PM2.5, CO2, CO, SO2, NOX, NH3, O2, etc. Keeps automatic record of above parameters. Upload data to regulatory agencies server. Supported by highly accomplished crew of employees, we are rendering Stack Emission Monitoring. These provided services are delivered under the stern supervision of adroit personnel as per set industry principles. In addition to this, these provided services are attributed amid our client for reliability and cost effectiveness. 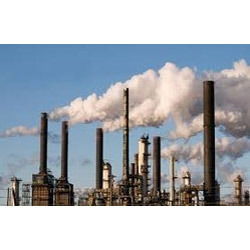 Our company holds vast experience in this domain and is involved in offering Stack Emission Monitoring. We are providing Indoor Air And Stack Emission Monitoring And Testing Services to all our consumers at most reasonable costs. Emissions Testing (a.k.a., Stack Sampling or Stack Monitoring, etc.) is the experimental process for evaluating the characteristics of industrial waste gas stream emissions into the atmosphere. Materials emitted to the air from these sources can be solid, liquid, or gas; organic or inorganic.